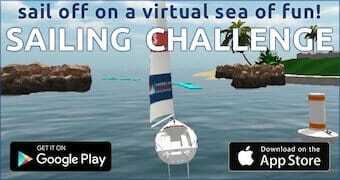 This fun, appealing, modern and easy boat has been designed to entice aspiring new sailors to discover the world of sailing. 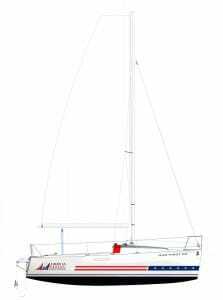 The ASA First 22 is a product of the collaboration between Beneteau’s design team and the input of ASA’s schools and instructors. a very large extended cockpit that easily fits four students and an instructor. The hull is stiff, virtually unsinkable due to positive flotation, and it’s shape aids stability. 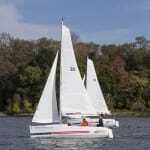 The deck and rig were designed specifically for sail training. 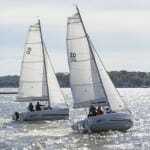 There are tons of ergonomic and safety innovations that will ensure sailing lessons will be comfortable and safe. The boat has a swing keel – ideal for shallow water venues and it makes trailering the boat very practical. 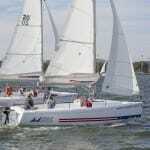 There is an optional asymmetrical spinnaker for more advanced students. 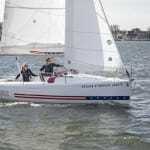 The new ASA First 22 is built in the USA at Beneteau’s factory in Marion, South Carolina. 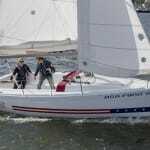 Even though the boat was designed for schools the ASA First 22 makes a great day sailor – perfect for family sails and helping friends and children learn the ropes. ASA Members and ASA Affiliates should contact their local Beneteau Dealer for more information about pricing and availability. Passage Nautical Enterprises – Oakland, Northern California. 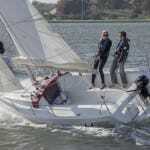 Tradewinds Sailing School & Club – Richmond, Northern California. Naos Yachts – Marina del Rey, California. Florida Yacht Group – Coconut Grove, Florida. Murray Yacht Sales – New Orleans, Louisiana. 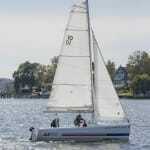 Great Hudson Sailing – West Haverstraw, New York. 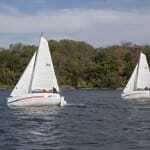 The Sailing School – Delran, New Jersey. Order An ASA First 22 For Your School!